One of the perks of the second trimester are all the baby kicks, finally you have movement in your belly – the pregnancy starts feeling very real. Obviously, it felt real before but now you have a person moving around and becoming developed and you don’t just have a chubby belly, tiredness and nausea weighing you down. It feels as if you finally have proof that there is a living, breathing person in there, and I don’t know about the rest of the mamas out there, but that’s when I really started feeling like a rock star as a result of my pregnancy. At this point I started feeling strong and powerful, where I had just felt weak and beat down up until this point. I also feel like baby kicks are also like this little secret between mum and baby, because unless you say something, no one has any idea that your little one is doing a dance in your belly! I ran into the problem that the baby wouldn’t kick when it sensed anyone else was around, it was weeks of kicking before I was able to show Jared! I had to whisper to him to slowly walk over to me, sit beside me without bumping me and gently put his hand on my belly – every other time the baby stopped quick! Almost like a thief being caught in the act! The baby also seemed to know exactly when I would pick up my phone to take a video, because I have WAY too many videos of my belly doing NOTHING, when seconds before it was doing the wave because baby was so active. Or my lovely puppy puts his face in the way and wrecks the video! My baby only seems to be active when I’m not, so I will be laying down to bed and all of a sudden I’ll have a little kung-fu master doing all their training in my belly, and then I won’t be able to fall asleep! I am way too distracted by baby kicks to just ignore them and move on with whatever I was doing. I keep stopping to take in the moment, which of course isn’t a bad thing, but it means that I am not doing anything I am supposed to be like getting sleep or my work. Aren’t I supposed to “sleep while I can” and have the sleepless nights once they get here? Or did I hear that one wrong? 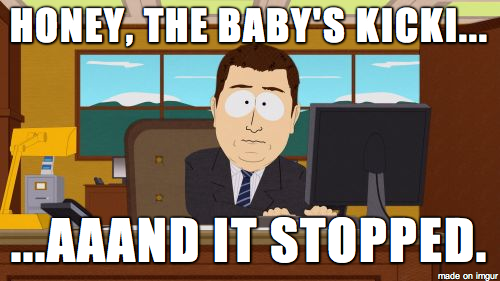 Other than the distraction and the keeping me up all night, there has been absolutely no downside to baby kicks (yet), but as I approach my third trimester I know that baby will be growing even more and my ribs, back and everything else will be feeling the wrath of my child – even though giving them a nice, comfortable room, letting them steal my nutrients and wreak havoc on my body seems like a good enough reason not to kick the snot out of me, but it’s been a while since I was a baby, I don’t remember my baby logic! All-in-all, these baby kicks has made me even more excited to meet Bump, and it’s almost crunch time! I have about 8 weeks left of work and about 13 weeks left until my due date! For all those that say that pregnancy is a slow moving process, I haven’t experienced that yet at all! It feels like yesterday we told everyone that I am pregnant and all of a sudden it’s June and we’re almost on the home stretch! Mamas! What was YOUR favourite part of your pregnancy? Let me know in the comments!